Am I really stupid? The morning that we had people in our kitchen installing new countertops, I decided to start a Fuel Cycle. Let me clarify: I’ve been stalled for awhile, even after down-sizing my portions. I decided that my metabolism needed a reset (and I really appreciate Fuel Cycles because they remind me to go back to a more “whole foods”, simplistic approach), so I started a Fuel Cycle. Only this Fuel Cycle is a little different. I know I’ll have a lot of obstacles to work around, since this first weekend our countertops are getting replaced, we’re going to special meetings on Sunday that are an hour away (and will be eating lunch there), and we have relatives coming to visit. And of course I have recipes in the works for my blog. I’ll definitely be posting some Fuel Cycle recipes, but there are other recipes that I’m in the middle of perfecting and I don’t want to just leave them hanging. But I decided that it was now or never, and I’ll just do the best I can and not fuss too badly at myself for missing a “correct” meal here and there. To read more about my Trim Healthy Mama journey, click here. | Clicking on an image in this post will take you to a pin for that image. Worked doing chores and riding all morning and got home around 12 to find that the countertops were already finished! Praise the Lord! I grabbed some Meringue Skinny Chocolate out of the freezer since I’ve already gone too long between meals. Around 12:20 we ate lunch. I had some lettuce leaves with lunch meat, olive oil, and nutritional yeast. I’ve started to love nutritional yeast to add good flavor to things (like this soup recipe). To help fill me up I made a Cake in a Mug from the book Trim Healthy Mama. I didn’t get the book out and just kind of guessed at amounts, added a bunch more water to make it more puddingish, and it turned out great. I poured some almond milk on top. 3 PM – I’m starving. Peppermint white hot chocolate (another made-up recipe with a half scoop of whey protein powder) with Meringue Skinny Chocolate. (half an hour later) Still starving. More lettuce, lunch meat, olive oil, and nutritional yeast. Making a Shrinker-style drink to try to fill me up with liquid + get my metabolism going. 6:30 PM – Been starving since lunch. For supper I had buttered kale and bacon with an egg (see the recipe below-click here for a pin), a small salad with a sprinkle of mozzarella cheese and some coconut oil dressing my sister made, some Meringue Skinny Chocolate, and a chocolate protein glucomannan pudding which served to mostly fill me up. 10:30 PM – Got hungry again so I made up a recipe for fuel pull, fuel-cycle friendly, dairy-free, sugar-free, low-carb, low-fat, protein-packed, single-serve ice cream made in a bag. And surprise, surprise, it was a-maz-ing. I didn’t write down the recipe though…sorry. 😛 Maybe someday I’ll have to dig out that idea again and preserve it for posterity. 1 PM – Ugh. I am having the hardest time staying full. Options are definitely limited right now with our kitchen still not fully functional. For lunch I had canned tuna heated with spices and topped with one slice of hot pepper cheese. I then had some lettuce leaves with olive oil and nutritional yeast. I then drank a mug of chicken bullion broth in an attempt to fill myself up with liquid. I am now slurping some warm glucomannan/gelatin protein pudding. I added some coconut oil to it. Still barely full. Deep S days are definitely the hardest for me (I’ve done a Fuel Cycle before, although just one week’s worth.). Thankfully I’ve managed to stay totally on it, despite our kitchen issues. 5:20 PM – Out riding in the cold. Came in and ate two small slices Muenster cheese and two slices of lunch meat. And Meringue Skinny Chocolate. In between this snack and supper I had some raspberry zinger tea with THM Pure Stevia Extract Powder and some gelatin. Oh, and by the way, the sink is fixed! 7:00 PM – Saturdays are weird eating times for us. I had a deer meat hamburger (and then another half patty) with butter, hot sauce, horseradish, dill pickles, and kale. I had some more kale with olive oil and nutritional yeast. For dessert I made myself a cinnamon cake/steamed pudding concoction of sorts that I just kind of threw together with Deep S ingredients (I learned that oat fiber is approved on a Deep S day occasionally!). 10 PM – I don’t advocate eating so late at night…but I was hungry. And I’m still hungry. Even after I had a pudding concoction made with protein powder, gelatin, water, almond milk, almond flavoring, salt, and sweetener. And two small slices of Muenster cheese. I’m probably over-doing the cheese, but I’m HUNGRY! Today (Sunday) we attended some fellowship meetings for a loose affiliation of Mennonite churches in the Southeast US…and I stayed completely on my Fuel Cycle! Normally I would be a big advocate of “when in Rome…”, but after spending the past two days ravenously hungry, I decided that if I were in this much agony over this dumb Fuel Cycle, I was gonna do it RIGHT and not sabotage myself (don’t get me wrong-while I don’t enjoy Fuel Cycles, I wholeheartedly advocate trying them once in awhile to reboot the metabolism). I packed my lunch and ate it in the van, all by my lonesome. Then later tonight we had relatives over for supper and my mom prepared a scrumptious-looking hamburger chip dip and off-plan mocha cake and vanilla ice cream (my WEAKNESS-definitely working on a THM version of that for the holidays as it’s a family tradition)…and I stayed true to my Fuel Cycle. Now I can breathe. The worst is over. Both in the form of temptations *and* Deep S days…for week one, at least. I snacked on some veggies between supper and my later snack because I was hungry. And I had some raspberry tea with Truvia. 9:30 PM – one of the best things I’ve had so far all Fuel Cycle: a custard of sorts that I will have to make again and post the recipe for. Exercise: Sunday is a day of rest. I did do some hiking through the woods that left me breathless though; we live in upstate SC, which meant that I was basically traipsing up and down a mountain. 12:30 PM – Home from work and grabbed some sliced yellow and red peppers to munch on since I was already past the four hour mark. About half an hour later for lunch I had a sandwich made with half a Joseph’s lavash, lite mayo, a little steak sauce, some lunch meat, and kale. I also made myself a PB&J shake. I was going to add protein powder but I forgot. I topped off the meal with a mug of Oolong tea because the shake made me freezing cold. I’m not nearly as hungry today on a Fuel Pull day as on my Deep S days, believe it nor not. Must have been the coconut oil. Shows what kind of good it can do for ya, eh? 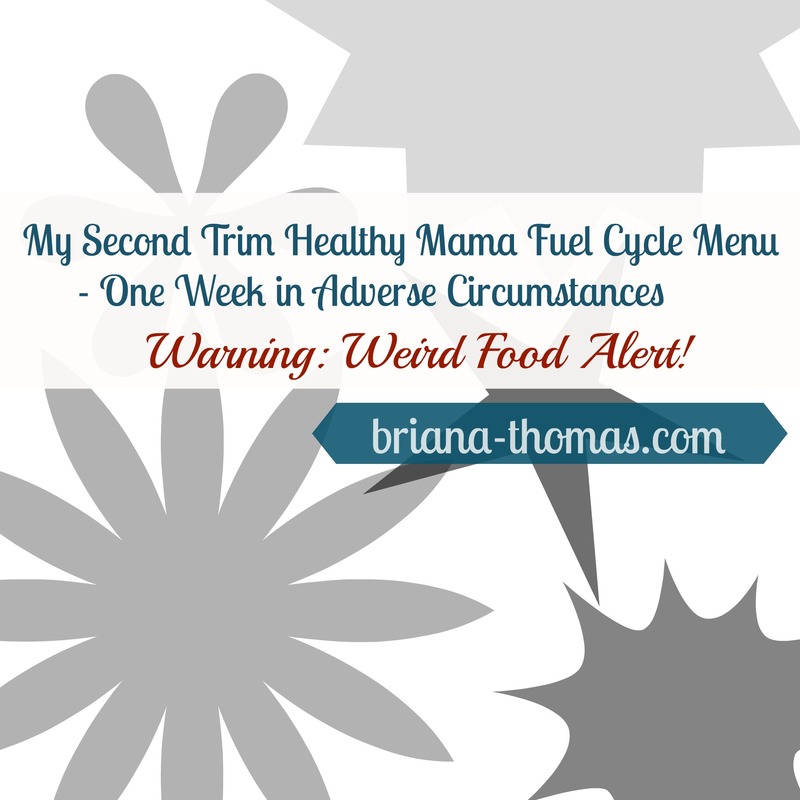 I’ll definitely be implementing more of it into my meals…after this Fuel Cycle, that is. I think the world is against me: my mom and her sister are planning a family get-together this weekend. How many obstacles do I have to overcome during this Fuel Cycle?? I had to by-pass the mocha cake at lunch again today! 4:15 PM – I would’ve eaten earlier but we were taking family pictures. When we came in, I ate some cottage cheese with a tiny squirt of Reddi-Whip, some sugar-free chocolate syrup (here’s the brand we like), and a sprinkle of defatted peanut flour. It really hit the spot. I’m still kind of hungry, but supper will be in less than three hours so I think it better to go light in the snacking department. I have decided that I will probably only do one week of the Fuel Cycle so I can have more flexibility with testing (and tasting) recipes for my blog and up-coming e-book. While on a Fuel Cycle, I want to do things right, so I haven’t even used the liberty I was going to give myself at the beginning of this thing. This one week has reminded me of a lot of things I need to change in order to reach my goal weight, so I have high hopes that even after I finish this week out, I’ll be able to implement things I’ve learned and reach goal quite soon. 6:55 PM – later supper than I was expecting and boy was I ready for it! I had a FP pizza on half a Joseph’s lavash. I topped it with some tomato paste, garlic powder, oregano, chopped onions and mushrooms, and two slices of turkey bacon. Later when I was eating it I sprinkled some steak sauce on it. I had some fresh veggies on the side, and then I made a cinnamon cake/pudding (egg whites, canned pumpkin, water, baking powder, salt, stevia, cinnamon, and oat fiber) and topped it with Reddi-Whip, some sugar-free syrup, and some almond milk. I had some hot tea with Truvia and gelatin afterwards. 11/11/14 Fuel Pull is so easy compared to Deep S. I might just have to implement a full day of Fuel Pull here and there (in between days of healthy fats and slow-burning carbs to keep things in moderation) while I’m trying to whittle the pounds off. 8:30 AM – a FP cake of sorts (the same base as the one I had for supper last night, only without the pumpkin and cinnamon), this time seasoned with ginger and some banana flavoring; a sprinkle of blueberries; Greek yogurt; unsweetened almond milk; a swirl of sugar-free syrup; and a mug of Oolong tea. I had a big bowl full of goodness that filled me up quite well. Have you begun to realize the sort of stuff I usually eat? 😛 Usually it’s just some concoction I dump together in a bowl using as few utensils as possible. Usually just the spoon that I will end up eating the thing with. I just eyeball all the measurements with that spoon, stir it together, microwave it (you could bake it if you like), dump stuff on top, and chow down. We got company at 1 in the afternoon and were gone all afternoon thrift store shopping. I was so hungry… I should’ve eaten a snack in the afternoon, but we were not at home, so I suffered. Graciously. 6:30 PM – I’m pretty proud of myself for staying on plan despite company and the ultimate warm peaches and cream cheesecake dessert with vanilla ice cream… For supper we had deer steak rolled in flour and fried in butter. I dipped mine in mustard and oat fiber instead and used a very small amount of butter. I had salad with low-fat Italian dressing. For dessert I had cottage cheese with some defatted peanut flour and sugar-free chocolate syrup. That’s pretty awesome, actually. Kind of like a Reese’s cup, and the creaminess is quite satiating. I also had a mug of hot tea sweetened with Truvia. I did cheat a tiny bit and had 5 tiny pieces of coffee-flavored chocolate (called Mocha Beans; they’re Norwegian, given to me by my boss whose sister was visiting from Norway). 10:00 PM – Ended my Fuel Pull days with a FP version of Amanda Coers’s Snickers Hot Cocoa. I omitted the cream and used 1 T of defatted peanut flour instead of the peanut butter. It’s almost a little overwhelming to be eating carbs! A good kind of overwhelming, though. I have discovered that carbs make me very thirsty. 12:40 – Oops…went over 4 hours. For lunch I had a salad with browned deer burger (very lean) and fat-free Italian dressing. I had some carrot sticks; and for dessert I had cottage cheese with half a sliced banana, a sprinkle of defatted peanut flour, some sugar-free chocolate syrup, and a small squirt of Reddi-Whip. It tasted reminiscent of a banana split! I also had a mug of Oolong tea. 3:30 PM – another “banana split”, this time with Greek yogurt instead of cottage cheese. Not as good, though. The tang of the Greek yogurt doesn’t complement the flavors as well. 6:30 PM – I made some yummy yummy fried rice with chicken breast (recipe to be included in an ebook I’ll be publishing eventually) as well as some baked carrots for supper tonight. I may have over-done my carb limit because I had a slice of cinnamon craisin bread (toasted with a smear of butter) for dessert. But what can I say? The bread was fresh-baked this afternoon and it’s one of my favorite things EV-ER. I’ll probably stick to a FP snack later if I eat a snack. And I can’t forget to make some chocolate overnight oatmeal for breakfast tomorrow! 9:30 PM – I had some raspberry hot tea earlier in the evening. For an evening snack I grabbed about 5 bites of leftover supper. I wasn’t even very hungry. Today is my last official day as I’m doing only one week of a proper Fuel Cycle. Tomorrow I will be doing another Deep S/Light S/Fuel Pull day to flush some of this glucose build-up from these two days of straight E as well as replenish my healthy fats, so I will be weighing in on Saturday morning. #excited I can tell I’ve lost a decent amount of weight, so it will be interesting so see what the scales says. 5:30 PM – we have Kid’s Club at church tonight (where pizza is always served for supper…no go on that one; I can’t even eat the toppings off this time.) and I was running late so on my way out the door I grabbed some cottage cheese and an apple. That was the extent of my supper. Needless to say, that pizza was definitely calling my name by 7:30, but I resisted. 9:00 PM – home from Kid’s Club and ravenous, but since it’s so late I decided to go with Fuel Pull. It’s chilly out so I made myself a blender cup of hot chocolate. It turned out so thick and frothy and chocolatey and amazing! And then I was still hungry (no surprise), so I made myself a quick sandwich on half a lavash with low-fat mayo, some kale, some mustard, some steak sauce, some fried deer burger, and some dill pickles. Last day!!! I’m doing a Deep S/Fuel Pull day today, and maybe I’ll include some light S too, depending on what my mom’s plans are for supper. Basically I just want to flush some of the extra glucose out of my system before weighing in in the morning because when your body has to digest glucose, it holds water. Hence why I was so thirsty the past two days. 12:15 PM – One thing this Fuel Cycle has taught me: hunger can be a good thing. I used to be paranoid of getting hungry, but now I’m willing to get hungry before my next meal. For lunch I had a brat with a sprinkling of mozzarella cheese and some mustard, a lettuce/kale salad with another sprinkling of mozzarella cheese and some Ranch, and some Deep S custard. My overall lunch was a regular S, although I tried to go very easy on the non-Deep-S fats. 3:30 PM – Briana’s Hot Chocolate (yeah, that’s right: the hot chocolate I named after myself), which is conveniently Fuel Pull, warm, chocolatey, thick, creamy, and filling. All at the same time. 6:30 PM – I made a hamburger chip dip (that I dipped with celery) out of regular S ingredients, although I kept it fairly light except for the cheddar cheese. I even used venison burger, which is very lean. I’ll be tweaking the dip some more and including it in an upcoming e-book, hopefully. For dessert I had some Deep S custard (using coconut oil instead of butter for metabolism-boosting properties). 9:30 PM – I was intending to have some FP hot chocolate again for a snack, but I wasn’t very hungry. I *was* cold, so I made myself a mug of hot tea. Eat more simply. I don’t have to have 3 or 4 different kinds of food in a meal. That leads to over-eating for me personally, so I’m better off sticking with fewer different items, especially if I want dessert. More Fuel Pull. Utilize FP snacks more often. Eat lighter desserts, especially after already-heavy meals. Eat your dessert for breakfast or as a snack (include protein)! Non-scale victory: my riding breeches fit well! And are actually starting to slide downwards instead of giving me a gut ache. Curious if peanut flour can be used in deep S meals? I know we should avoid actual nuts and nut butters…but the peanut flour is defatted so does it still count the same way? Thanks! This is so helpful to me. And for you to stick with it without a functioning kitchen is a big deal. One thing I’ve found helpful is to eat the same things on the same types of days. So for Deep S, I made 3 servings of each recipe on day one–then days 2&3 I just reheated. thanks for sharing – I’m slowly getting this but am starting to realize a Fuel Cycle might be necessary due to a highly damaged metabolism. you go girl! sounds like quite a week! HAT OFF TO YOU, BRIANA ! EXERCISING LIKE THAT – YOUR SELF CONTROL, I MEAN – WILL TAKE YOU A LONG WAY. THEY’VE FIGURED OUT THAT OUR WILL IS LIKE A MUSCLE. EXERCISING OUR WILL STRENGTHENS IT, BUT, LIKE A MUSCLE, ONLY TO A POINT. YOUR ENTHUSIASM IS CATCHING. KEEP UP THE GOOD WORK !